Last week we unveiled our new T Shirt collection for Autumn Winter 2017, featuring two Stunning Arrivals by Farah. Next up, it’s time for a closer look at the rest of the Farah range. This international brand has reinvented itself in the UK as a vintage menswear staple, winning over hundreds of our customers due to its consistent innovation. Here’s four superb Farah AW17 new arrivals for your consideration . . .
Don’t forget to use our offer code FARAH17 to claim 10% off all Farah AW17 gear! 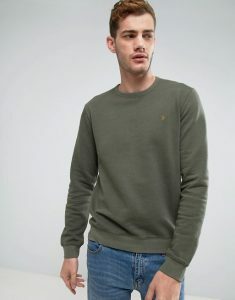 Before the temperatures start to slide and the leaves begin to turn brown, you’ll need a quality sweatshirt for those fresher mornings.. That’s where Farah’s Pickwell range comes in. Made with a comfortable washed cotton fabric and in loop back (not fleece lined), you’ll struggle to find a comfier sweatshirt this Autumn. The new Military Green colour, with its grey-green complexion, is perfectly at home with any of our vintage jeans. Aside from this Farah AW17 special, there are two older colours to choose from — Sea Front Blue and Seashell Pink. 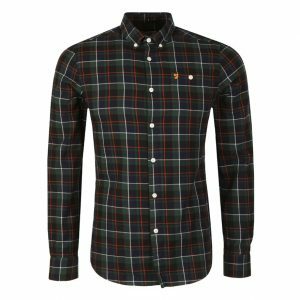 It might be called a Grandad collar, but the design of this Farah AW17 button through shirt is a classic style suitable for all ages. Its a timeless look, and one that we’re proud to offer here at Apache. The soft 100% cotton material comes with a “melange” effect, and the usual Farah Semi slim fit brings out a flattering shape in guys of many different builds. 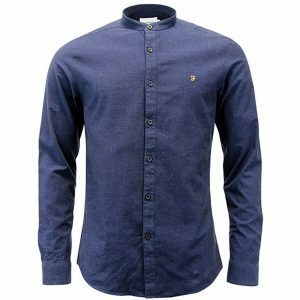 Farah have brought out two sublime AW17 colours for this Grandad shirt — True Blue (pictured) and Gravel. Here’s a one-of-a-kind creation from the vintage masters in Farah’s design team: a Stunning button-down check shirt. It has a slightly preppy vibe, for a smarter look without actually “dressing up.” Look closely and you’ll see a gorgeous twill cross-weave on the fabric, giving the garment a unique handle; 100% soft and in a lighter weight for added comfort. The bottle-green tones are a perfect compliment to a pair of dark wash jeans. There’s also a version in Farah Red. Simplicity is the key to this Farah AW17 Long Sleeve T Shirt, from the plain design to the basic colour options — White or Black. 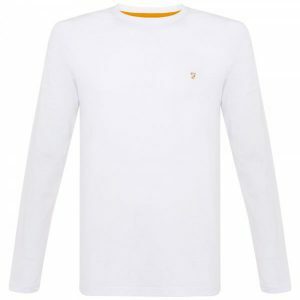 Made with the same “Denny Slim” fit as Farah’s core T Shirt range, this garment is popular worn either on its own,or as un under garment like under a jumper. 100% Cotton and from Small to Extra Large. That’s just a taster of our fabulous new Farah AW17 range with more due to arrive throughout August and September. Explore the full range here, and remember to use our offer code FARAH17 to claim 10% off!